landing, just to watch them melt. We followed the shade around the house. a brick of Bonomo’s Turkish Taffy. then hide and seek in the mosquitoey dark. This poem first appeared in Rattle. 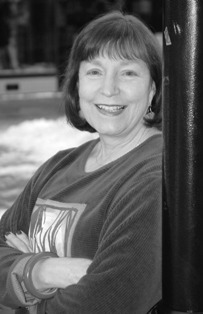 Barbara Crooker is the author of ten chapbooks, three full-length books, and more than 750 poems published in more than 2300 publications. She credits her achievements to perseverance as much as talent, the willingness to take a poem to its 50th draft, if need be. Barbara lives and writes in Fogelsville, Pennsylvania, but grew up in the Mid-Hudson Valley of New York State, where this poem is set. Read more about her at www.barbaracrooker.com. Bonomos Turkish Taffy and Sugar Daddy's lolly pops. So much a part of me, too. Thanks. I agree with Anjie, "Oh, yes." Lovely! Works for the sixties, too! How satisfying to connect so directly with a poem that I thought surely it was set where I grew upâ€”in the Southâ€”and then find that the poet grew up in New York! Was it the Fifties that created so magic a bridge?